Thorlabs' Confocal Laser Scanning (CLS) Microscopy Systems are compact imaging modules designed to bring powerful confocal imaging tools within the reach of any research lab. By eliminating signals that originate from outside the focal plane, confocal microscopy provides the ability to acquire high resolution, optically sectioned images from within a thick sample or to reduce background fluorescence from thin cultures. 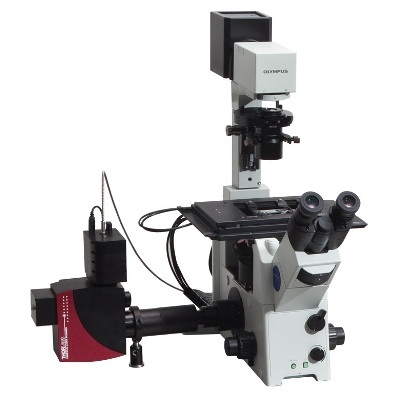 The CLS systems offer turnkey integration to virtually any upright or inverted microscope (not included) with access to the intermediate image plane (e.g., camera port) via a C-Mount threading. The included ThorImageLS™ software drives the CLS hardware via an intuitive graphical user interface, providing quick data recording and review. Our basic Confocal Laser Scanning System includes an electronics control unit, an expandable dual PMT module, a 16-position pinhole wheel, a two-channel (488 nm & 642 nm) laser source, and the ThorImageLS™ acquisition software and computer workstation. For more sophisticated imaging requirements, systems are available with up to four laser lines and four high-sensitivity GaAsP PMTs.